So! Are you sick of looking at you dirty couches, wishing they looked so much better?! Well they can! Cleaning Mate can remove all those nasty coffee spills, food marks and just general dirt buildup. Whats even better? Our excellent prices. You wont find any cheaper in Brisbane. Dust mites are not our friends! We need to let them know that they do not belong in our homes! While they can never be truly eliminated, frequent and thorough cleaning improves our family's health, enhances the appearance of our beautiful Brisbane homes, and reduces the risk of disease and allergies. Many of us with young children, have a heart attack whenever we see our children with anything spillable near the brand new couch. Imagine a big spaghetti stain smeared across the ottoman of the couch you’ve spent months to save for- headache right? Cleaning mate offers the peace of mind that any disaster can be redeemed in just a matter of hours. We have technicians on call all the time- just for occasions like these. 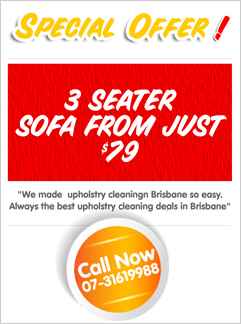 We provide the absolute best upholstery services in Brisbane with unbeatable prices. Perhaps spills aren’t your biggest concern, but you and your family suffer from allergys and skin reactions so commonly caused from dustmites. Our hot water extraction process removes all unwanted friends hiding in your mattresses and sofa seats. Frequent vacuuming and professional cleaning help to keep these pests away and keep the smiles on your family’s face.